I had an a-ha moment Saturday night, while ironing Caroline's dress to wear to church the next morning. I realized that I associate ironing with being stressed out. Why? Because I am always ironing at the last minute, stressed & a mess - particularly on Sunday mornings. As I stood there that night, ironing her cute little dress, I thought, "Hmmm...this is kind of relaxing." Then I realized it's because I had plenty of time to get it done so I didn't feel stressed. My thoughts continued on that vein and I realized that I bring a lot of unnecessary stress into my life, just by putting things off. For example, last month, I procastinated prepping for my cards class until 2-3 days before. I sat at my desk and looked at the sketches I had drawn and the supplies I had purchased and my mind went blank. I wasn't super crazy about any of the sketches OR the supplies. I looked at it all and thought, "I got nothin'." Finally, one day before, I pulled it together, after much stress, agonizing, hair twisting and irritation with myself for putting it off! Not fun! Now...in stark contrast, the other night, knowing I had several weeks before another class, I sat on my bed and brainstormed. I wrote out thoughts, sketched cards, and created a few goals and parameters to make it all easier. The ideas just flowed out of me. It was amazing and fun. It's like the part of my brain that I need to be creative does not like to be put on the spot. I recently listened to a podcast where they talked about how even when you're not trying to be creative, your brain is still coming up with ideas. Then when you relax enough, the ideas will flow and pop into your mind! So maybe creativity can't be forced? I used to say I work best under a deadline but now I think I work best knowing I have a deadline looming, but never waiting until the last minute. That applies to so many things in my life! "I do not believe in procrastination. I believe in being organized and getting things done so I can focus on what's really important in life." Wow. I wrote it down immediately and have repeated it to myself often, because I know that if I procrastinate, I am miserable! If I wait until the next day to clean the dinner dishes, I wake up grumpy with a dirty kitchen. If I don't do the laundry....we don't have clothes to wear or towels to shower with and then I feel like a Mom/wife failure. Procrastination is a key character flaw of perfectionists, such as myself. In our minds, if we can't take time to do it perfectly - we don't even start it. We wait for the perfect moment. It never comes. 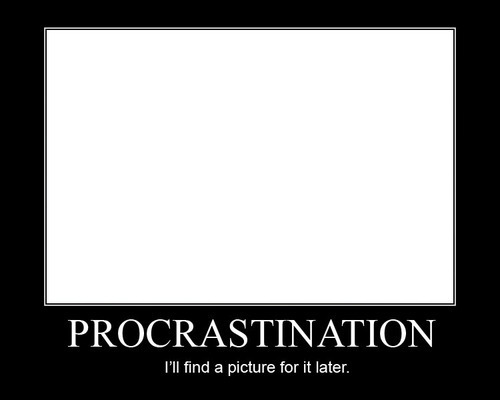 But I think that telling myself, "I am a perfectionist so procrastinating is normal for me." has been detrimental to what I believe about myself. Instead, I'm going to tell myself that I believe, as Jamie Lee, that I get things done and will not allow myself to procrastinate. We're moving into the second half of 2012. It is a good time to revisit our goals for this year. 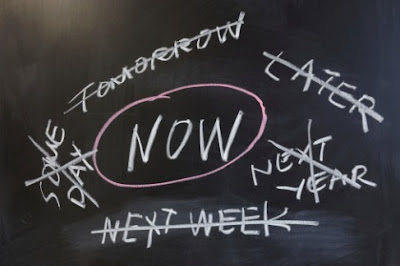 I'm adding to my list - DON'T PROCRASTINATE. Or instead, maybe I'll adopt "Do it now." as one of my mottos for 2012. Yep, that's me too...good thoughts you have here! Most of my stress is brought on by me! I can relate to this, I know exactly how you feel, I also like working to a deadline to get me moving, but when the deadline gets a bit too close it becomes very stressful!